Terra Australis is the large continent on the bottom of this 1570 map. 600 BC – 300 BC – Greek Philosophers theorize Spherical Earth with North and South Polar regions. 150 AD – Ptolemy published Geographia, which notes Terra Australis Incognita. 7th century – Ui-te-Rangiora claimed to have sighted southern ice fields. 1772–1775 – James Cook – sails HMS Resolution crossing Antarctic Circle in January 1773 and December 1773. On 30 January 1774 he reaches 71° 10′ S, his Farthest South, coming within about 75 miles of the Antarctic mainland without seeing it. 1819 – William Smith discovers South Shetland Islands (62°00′S 058°00′W﻿ / ﻿62.000°S 58.000°W﻿ / -62.000; -58.000), the first land discovered south of 60° south latitude. 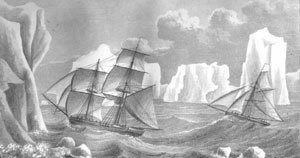 1819–1821 – Fabian Gottlieb von Bellingshausen and Mikhail Lazarev, Admirals of Russian Imperial Navy, during Russian circumnavigation expedition, on 27 January 1820, discovers an ice shelf at Princess Martha Coast that later became known as the Fimbul Ice Shelf (69°21′28″S 2°14′50″W﻿ / ﻿69.35778°S 2.24722°W﻿ / -69.35778; -2.24722). Bellingshausen and Lazarev became the first explorers to see and officially discover the land of Antarctica. 1820 – Edward Bransfield with William Smith as his pilot – on 30 January 1820, sight Trinity Peninsula (63°37′S 058°20′W﻿ / ﻿63.617°S 58.333°W﻿ / -63.617; -58.333). 1821 – George Powell, a British sealer, and Nathaniel B. Palmer, an American sealer, discover the South Orkney Islands. Powell annexes them for the British. 1851–1853 – Mercator Cooper landed on what is now known as Oates Coast in what is probably the first adequately documented landing on the mainland of Antarctica. 1872–1876 – HMS Challenger under Capt. George S. Nares, becomes the first steamship to cross the Antarctic Circle; reopens the study of oceanography in the region after a 30-year gap. 1892–1893 – Carl Anton Larsen led the first Norwegian expedition to Antarctica aboard the ship Jason. Larsen became the first person to ski in Antarctica where the Larsen Ice Shelf was named after him. 1965–1965 – Operación 90 – Terrestrial Argentine Expedition to the South Pole Led by Coronel D. Jorge Leal. 1998-99 - Eric Philips, Jon Muir and Peter Hillary pioneer a new route from Ross Island to the South Pole through the Transantarctic Mountains via the Shackleton then Zaneveld glaciers. The expedition covers 1425km in 84 days setting off November 4, 1998 and arriving January 26, 1999. The team were not able to complete their original objective of completing the first unassisted return journey to the South Pole. 2000–2001- Norwegian Liv Arnesen and the American Ann Bancroft crossed Antarctica on ski-sail from Blue 1 Runaway November 13th reaching after 94 days of expedition McMurdo, passing through the South Pole. 2001/2 – First and longest sea kayak expedition by New Zealanders Graham Charles, Marcus Waters and Mark Jones paddle unsupported from Hope Bay to Adelaide Island in 35 days. 2004 – Scot100 First ever Scottish Expedition to South Pole began in October 2004 – a century after a historic expedition led by William Speirs Bruce, Edinburgh's "unknown" explorer, who Craig Mathieson views as "truly the greatest polar explorer of all time". 2004–2005 – Chilean South Pole Expedition. 2004–2005 – Tangra 2004/05 created Camp Academia. 2005 – Ice Challenger Expedition travelled to the South Pole in a six-wheeled vehicle. 2005–2006 – Spanish Trans-Antarctic Expedition, led by Ramon Larramendi, reached the Southern Pole of Inaccessibility using kite-sleds. 2007 – Pat Falvey leads an Irish team to reach the South Pole, skiing 1140 km only weeks after completing an unsupported Ski traverse of the Greenland Ice Cap in August 2007 in honour of Irish Polar Explorers such as Shakelton and Tom Crean. Clare O'Leary becomes the first Irish female to reach the South Pole. 2007–2008 – Norwegian-U.S. Scientific Traverse of East Antarctica. 2008 – First Venezuelan Scientific Expedition to Antarctica. 2008–2009 – Impossible 2 Possible (i2P) unsupported South Pole quest by Ray Zahab, Kevin Vallely and Richard Weber. 2009 – Kaspersky Commonwealth Antarctic Expedition, largest and most international group of women to ski to South Pole. 2009 – Second Venezuelan Scientific Expedition to Antarctica. 2009–2010 – Unsupported/Unassisted Antarctica Ski Traverse from Berkner Island to South Pole to Ross Sea by Cecilie Skog and Ryan Waters. 2010 – Moon Regan Transantarctic Crossing, first wheeled transantarctic crossing and first bio-fuelled vehicle to travel to the South Pole. 2010 – Third Venezuelan Scientific Expedition to Antarctica. 2011 – Fourth Venezuelan Scientific Expedition to Antarctica. 2011–2012 – From Novolazarevskaya to Pole of Inaccessibility to South Pole to Hercules inlet by Sebastian Copeland and Eric McNair Landry by kites and skis. 2011–2012 – Expedition by Ramon Hernando de Larramendi, by Inuit WindSled. 2012 – Felicity Aston becomes the first person to ski alone across Antarctica using only personal muscle power, as well as the first woman to cross Antarctica alone. Her journey began on 25 November 2011, at the Leverett Glacier, and continued for 59 days and a distance of 1,084 miles (1,744 kilometers). 2012 – Fifth Venezuelan Scientific Expedition to Antarctica. 2012–2013 – Aaron Linsdau becomes the second American to ski solo from the Hercules Inlet to the South Pole. His original plan was to make a round trip but through a series of problems, like all other expeditions this year, was unable to make the return journey. 2012 – Eric Larsen attempts a bicycle ride from coast to South Pole. Completes a quarter of the distance. 2012 – Grant Korgan becomes the first person with a spinal cord injury to literally "push" himself to the geographic South Pole! 2012–2013 – Shackleton's centenary re-enactment expedition of the journey of the James Caird aboard the replica Alexandra Shackleton. Six British and Australian Explorers completed the "double journey" on 10 February 2013 after the 800-mile journey from Elephant Island to South Georgia and the mountain crossing. 2013 – Sixth Venezuelan Scientific Expedition to Antarctica. 2013–2014 – Ben Saunders and Tarka L'Herpiniere make the first ever completion of the Terra Nova Expedition first taken by Robert Falcon Scott in January 1912. Their 1,801-mile, 105-day return journey to the South Pole is the longest ever polar journey on foot. 2013 – Parker Liautaud and Douglas Stoup attempt in December 2013 the Willis Resilience Expedition to set a "coast to Pole" speed record by reaching the geographical South Pole on skis in the fastest miles per hour ever recorded from an interior of continent start while being followed by a support vehicle. 2013 – Antony Jinman will walk to the South Pole solo for the 2013 ETE Teachers South Pole Mission, during which he will be in daily contact with schoolchildren from across the United Kingdom and will make films using the world's first drone flights at the South Pole. 2013 – Maria Leijerstam becomes the first person to cycle from the Antarctic coast to South Pole. She also set the human powered speed record in 10 days, 14 hours and 56 minutes. 2013−14 – Lewis Clarke (aged 16 years and 61 days) guided by Carl Alvey (aged 30) became the youngest person to trek from the Antarctic coast at Hercules Inlet to the South Pole. His expedition was in support of the Prince's Trust and his achievement is recognised by Guinness World Records. 2013-14 – Married couple Christine (Chris) Fagan and Marty Fagan became the first American married couple (and second married couple in history) to complete a full unguided, unsupported, unassisted ski from the Antarctic coast to the South Pole. They join just over 100 people in history who have traveled to the South Pole in this manner. Their expedition took 48 days. Their achievement is recognized by Guinness World Records. Learn more at www.3belowzero.com and www.christinefagan.com. A book about the expedition is forthcoming. 2013−14 – Daniel P. Burton completes the first bicycle ride from coast to the South Pole. 2013−14 – Chris Turney led an expedition, entitled "Spirit of Mawson", aimed at highlighting the decline in sea ice due to climate change. The expedition was abandoned when its Russian ship became stuck in unusually large amounts of sea ice. 2013 – In December 2013 the Expeditions 7 Team led by Scott Brady made a successful east-to-west crossing in four-wheel drive vehicles from Novolazarevskaya to the Ross Ice Shelf via the Scott-Amundsen South Pole Station. Expeditions 7's logistic plan included providing assistance to the Walking With The Wounded expedition, which was required at latitude 88°S. From the Ross Ice Shelf the Expeditions 7 team returned to Novolazarevskaya via the same route. 2015−16 – Henry Worsley died while attempting to complete the first solo and unaided crossing of the Antarctic. 2016-17 - Eric Philips (guide), Keith Tuffley and Rob Smith ski a new route to the South Pole from the Ross Ice Shelf through the Transantarctic Mountains following the Reedy Glacier. The expedition covers 605km in 33 days setting off December 8, 2017 and arriving January 10, 2017. 2016−17 – February 7 Mike Horn completes first ever solo, unsupported north-to-south traverse of Antarctica from the Princess Astrid Coast (lat -70.1015 lon 9.8249) to the Dumont D'urville Station (lat -66.6833 lon 139.9167) via the South Pole. He arrived at the pole on February 7, 2017. A total distance of 5100 km was covered utilizing kites and skis in 57 days. 2016-17 - Eric Philips (guide), Heath Jamieson (guide), Jade Hameister, Paul Hameister and Ming D'Arcy ski a new route to the South Pole from the Ross Ice Shelf through the Transantarctic Mountains following the Reedy Glacier then Kansas Glacier. The expedition covers 605km in 33 days, setting off December 6, 2017 and arriving January 11, 2018. 2017–2018 – Astrid Forhold (Norway), supported by Jan Sverre Sivertsen, skies the longest part of the original Roald Amundsen route from Bay of Whales to the South Pole. ^ a b Hoare, James E. (2012). "Antarctic Exploration". Historical Dictionary of Democratic People's Republic of Korea. Lanham: Scarecrow Press. p. 44. ISBN 978-0-8108-7987-4. ^ No Horizon is so far. Two women and their historic journey across Antarctica. Liv Arnesen, Ann Bancroft & Cheryl Dahle. Penguin Books. ^ Brent, Michel. "Polar Challenges / UK / Expeditions / Arctic Expeditions – Archives". v1.explorapoles.org. ^ Jardine, Ray. "Skiing to the South Pole in 59 days : Ray & Jenny Jardine". www.rayjardine.com. ^ "ExWeb interview Sebastian Copeland and Eric McNair-Landry (part 1/2): The battle of body and gear across 2 South Poles". www.explorersweb.com. ^ Michael Warren. "First woman to cross Antarctica solo sets two records". The Globe and Mail. Retrieved 28 January 2012. ^ "British adventurer Felicity Aston caps first ski crossing of Antarctica by woman". ESPN. 23 January 2012. Retrieved 28 January 2012. ^ "Amazon.com: Antarctic Tears: Determination, adversity, and the pursuit of a dream at the bottom of the world eBook: Aaron Linsdau: Kindle Store". www.amazon.com. ^ "The Push Documentary – A Film About Overcoming Adversity With Love". Push. ^ "Sit-skier Grant Korgan has pushed his way across Antarctica". espn.com. ^ PRESS, THE ASSOCIATED. "Paralyzed Nevada man Grant Korgan reaches South Pole – NY Daily News". nydailynews.com. ^ "Paralyzed athlete Grant Korgan achieves polar goal". sfgate.com. 29 January 2012. ^ "Korg Movement – Choose Positivity Now". Korg Movement. ^ Explorersweb (13 January 2011). "Breaking news: Christian Eide bags the South Pole solo speed ski world record". explorersweb.com. Retrieved 13 January 2011. ^ "Explorer dies in Antarctic crossing". 3 December 2018 – via www.bbc.com. ^ "SPEAR17". Louis Rudd MBE. 1 April 2018. Retrieved 24 February 2019. ^ "Mike Horn a dompté l'Antarctique en solitaire – L'illustré". archive.org. 13 February 2017. ^ "O'Brady's Antarctic Crossing: Was It Really Unassisted?". Explorersweb. Retrieved 24 February 2019. ^ January 2019, Maria Dombrov22 (22 January 2019). "An Impossible First: Colin O'Brady Completes Solo Trek Across Antarctica - GlacierHub %". GlacierHub. Retrieved 24 February 2019. ^ "Explorer completes historic Antarctic trek". Exploration & Adventure. 26 December 2018. Retrieved 24 February 2019. ^ "Second explorer completes Antarctic crossing". Exploration & Adventure. 28 December 2018. Retrieved 24 February 2019. 37. 'Extreme South' Struggles & triumph of the first Australian team to the Pole by Ian Brown, Published by Australian Geographic 1999. Savatyugin, L. M.; Preobrazhenskaya, M. A. (1999). Российские исследования в Антарктике [Russian Exploration of Antarctica] (in Russian). Saint Petersburg: Gidrometeoizdat, Arctic and Antarctic Research Institute (AARI), Federal Service for Hydrometeorology and Environmental Monitoring of Russian Federation (Roshydromet). ISBN 5-286-01265-5. "Soviet Antarctic Expedition". Information Bulletin. Amsterdam: Elsevier Pub. Co. 1958–1974. ISSN 0038-5271. 'Extreme South' Struggles & triumph of the first Australian team to the Pole by Ian Brown, Published by Australian Geographic 1999. ISBN 1 86276 031 4. Berkner Island is an Antarctic ice rise, where bedrock below sea level has caused the surrounding ice sheet to create a dome. If the ice cap were removed, the island would be under water. Berkner "Island" is high and completely ice-covered and about 320 kilometres (200 mi) long and 150 kilometres (93 mi) wide, with an area of 44,000 km2 (17,000 sq mi). It is surrounded by the Filchner-Ronne Ice Shelf. The northernmost point of the Berkner is about 20 kilometres (12 mi) from the open sea. It lies in the overlapping portion of the Argentine and the British Antarctic territorial claims. Cecilie Skog is a Norwegian adventurer. She studied and worked as a nurse, but since summiting Mount Everest in 2004, she has worked as a professional adventurer, guide and lecturer. Colin Timothy O'Brady is an American professional endurance athlete, motivational speaker and adventurer.